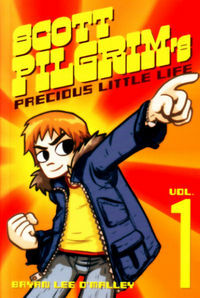 Scott Pilgrim's life is so awesome. He's 23 years old, in a rock band, "between jobs", and dating a cute high school girl. Everything's fantastic until a seriously mind-blowing, dangerously fashionable, rollerblading delivery girl named Ramona Flowers starts cruising through his dreams and sailing by him at parties..
Start at the beginning with this first volume of Scott Pilgrim's stories. It's been a long, long time since I've read a comic and truly enjoyed every page of it. Scott Pilgrim is a great, modern comic with fantastic art and excellent satire. Five stars! Legal Notice: Entire contents trademarked (® or TM) and copyrighted (©) 1986-2019 by Things From Another World, Inc. and respective copyright and trademark holders. All rights reserved. Page rendered at 2019-04-25 18:53:38 in 0.267 seconds.